Understanding SEO (Search Engine Optimization) is usually quite confusing as a beginner or a business owner with no prior knowledge of digital marketing. In this guide, I want to help you understand SEO. What it is, how it works and why for most business’s it really is worth doing (as long as it’s done well…. more on that later). Before I dive into it I want to paint a picture for you of a scenario that I see happening every day. This is the same for business owners all over the world and should help you understand SEO and its application. You have gotten your website online and it looks great. Well done you have made it past the first hurdle. Now all you have to do is wait for customers to fall from the heavens and it will all be worth it right! Although this is how most business owners expect their shiny new website to work, sadly it is not the case. So why is it that a new website doesn’t simply bring in business on autopilot? Well, let’s find out. I’m sure you have heard the term Search Engine Optimization or maybe you have heard something throwing around the shorthand version more commonly used which is of course SEO. If you hired a web developer or digital marketing company to build your website then you may have even been offered a range of affordable SEO packages. Most business owners are confused by the terminology and simply turn down any offer from an SEO specialist. That sounds like a great theory but it doesn’t tell us much about how it actually works. Let’s tackle this one step at a time. First up we have our search engine. While there are other well-known search engines such as Bing and Yahoo we are going to stick with the largest of them all, Google. We all use Google a lot these days. Usually when looking for an answer to a question. Where can I buy a car battery? What time does the movie start at this evening? And millions of other requests every minute of every day. So how is it that when we type these queries into Google that the right results/answers show up? This is SEO in action. Google crawls the entire internet and makes a library (index) of all of the sites and content. It uses things like Website or webpage age, keywords or terms and links to determine what the page is about and where it fits into the index of Googles search engine. Some of the things mentioned in this video are a little dated but the overall concept it still the same. The general idea is Google wants to show the most high quality and relevant web page it can to a person who is searching for something. Now that you have a general idea of how search works lets look at how it affects you and your website. Let’s start with a local business first to make it easier to understand. You get the idea. Karen will see results which Google considers most relevant to the terms she has searched. If you are a double glazing business and you are on the top of page one of the results Google shows Karen you are in luck. There is a good chance she will click on your website link and get in touch with you. So why are Senator Windows (in this case) higher in the rankings than company 2, 3 and so on. Occasionally this is blind luck but this is very rare. The most likely answer is that they have spent the time and effort putting together a quality website that provides the content that customers searching for these terms want to see. As Matt from Google said in the video the page contains the keywords the person is searching for and also contains relevant related content which people find useful. There are more factors but these form the foundations and particularly with a new website are a great place to start. Another great example of how a business can leverage this kind of technique to attract website visitors (who ideally then become customers) is this campaign by furniture giants Ikea. They looked at what their typical customers were searching for and used a combination of good SEO techniques and humor to put together an excellent piece of marketing. While this is not a typical example of using SEO to attract customers it does show you what thinking outside the box a little can do. How do I apply SEO to my website? 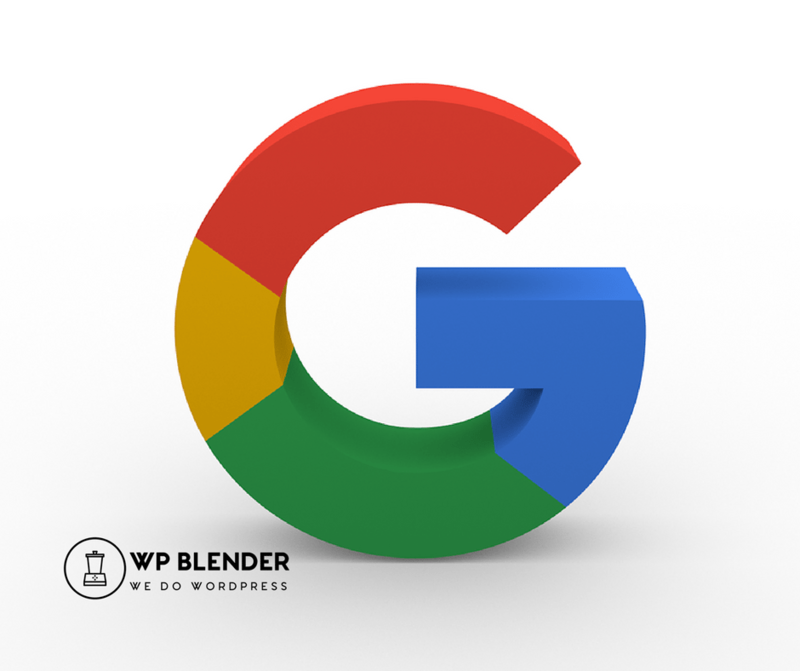 By now we understand the concept of customers searching for terms or “keywords” in Google and we understand that Google wants to show them the best Website to fit the query. So how do you go about making sure your website comes out on top when your potential customers are searching for your product or service? If you follow these steps you will be streets ahead of most of your competitors. Even if you decide to buy SEO services you will have a much greater understanding of the process. First up you need to figure out what types of terms your potential customers and clients are typing into the Google Search box. There are of course free and paid tools available to help with this. If you are just starting out and are restricted by your budget then grab this free Chrome extension. It’s called Keywords Everywhere. You will need to be using Google Chrome as your browser to use it. Once installed you can start searching for terms you think customers might use. You may have spotted this earlier in my example but may not have realized it. Unlike the standard Google search having Keywords Everywhere installed allows me to see additional information. There are additional pieces of info here but for now, let’s just stick to the search volume. In the case of our window supplier example, this term has a monthly search volume of 50. So what does that tell us? This means that on average 50 people search for this term each month. At first, this might not seem like much but this is for a small localized search in a particular area. Also, one thing that is often overlooked is if 50 people a month search for this term and 10 of them click on your website thats ten potential customers. Let’s say two of them become customers. Assuming a full set of windows costs €10,000 that’s€20,000 a month of new business. 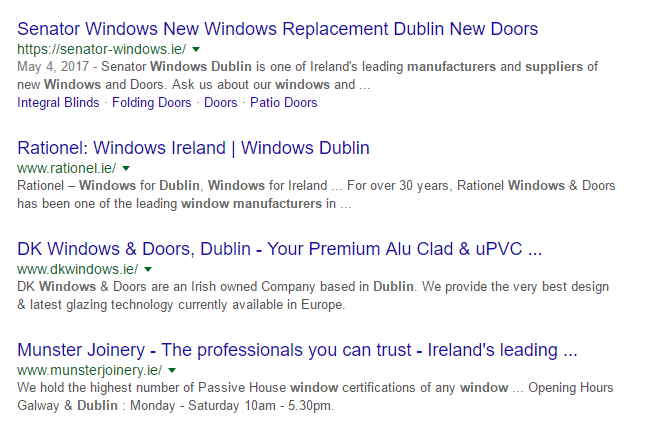 Imagine almost €250,000 of new business a year just because your website was number one in Google for a term like this. You can really see how the power of understanding SEO starts to become important. This is especially true when you consider that this is only one term and that you will probably target several terms. Where to find more terms? You may have noticed that Google displays related search terms at the very bottom of the search results page. 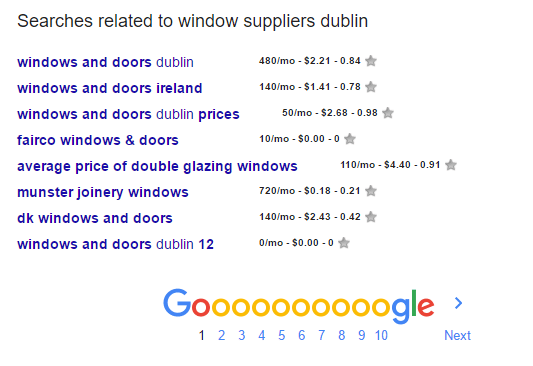 Just by searching that one term “window suppliers in dublin” we can see that 480 people a month also searched for “windows and doors dublin”. Using the rough calculations we did about if 48 of those visit your website and 20% become customers, well you get the idea. If you are just getting started Keywords everywhere will get you a long way. However, as with anything like this, there are paid tools which are more powerful. They also make it faster and more productive to carry out your research. There are a lot of different paid keyword tools available but I would recommend using KWfinder especially for beginners. It’s extremely easy to use and gets the job done quickly and with some great results. Wait a second, you were just talking about SEO and now you’re bringing up PPC. What in the world is PPC and why are you trying to confuse me. If you look carefully you will see there is a small symbol on the right under the word Dublin. This indicates that this is an Ad. So how is that different to the other results? It’s important to note the difference between results with and without the ad symbol. If it says ad then the website owner is paying to display their website for that search term. This is like a digital version of a newspaper advert but they only have to pay if you click. This gives us the term PPC or pay per click. I’m not going to go into these Google Ads in detail here. It’s just important that you understand the difference for now. But if I can pay to display my site why would I bother with SEO? This is a common question and a subject that is often misunderstood. If you and several competitors are all targeting the same terms with paid Google ads then you are all bidding against each other. Unlike traditional advertising where you pay a set fee for a certain ad type or size, Google ads are done by bidding. So if it’s a competitive area you could by paying €5 or €10 per click. If you don’t have a very high-value product or service this could get quite expensive. Additionally, when you stop paying for ads your website essentially disappears so there is no long-term advantage. In contrast, you can start paying for ads and have them appear within minutes on the top of page one of the Google results. This can be an advantage for a short term or last minute campaign. But let’s get back to our window example. If our window business owner puts in either the time or invests the money to outsource the SEO work in the short term their site will rise to the top of the Google results. I should correct myself here and say that if the SEO work is done correctly the site will rise to the top of Google. If you are looking at cheap SEO packages they may be too good to be true to watch out for dud offerings. Long term the site will go on ranking with maintenance and continue to bring in customers without the need to pay for ads. The downside is the upfront time or money investment and as SEO takes a little time to kick in you will usually have to wait at least 3 months to see results. We now have our keywords and topics from the research we did above. Next up you need to fill your site with relevant and useful content which includes these keywords. People can be lazy or just add any rubbish content to websites. Do not do this! Take the time to produce something your customers will want to read, watch or engage with and you will see the benefits. This like your product or service features, Frequently asked questions, view guides and so on. If you can help answer the query the person visiting your site is looking for you have a great chance of making a sale. It’s important to give as much info as possible. While it depends on the topic and also your competitors as a general rule longer content (text) will rank higher in Google. If you want to get into the technical details of how to structure your website and pages etc then I have a guide coming very soon which should help you. For now, if you have selected your keywords and produced a reasonable amount of quality, relevant content on your site then you are half way there. The last two major influences on how much love Google gives your website are Links and Social signals. This means how many other relevant websites link back to your site and how much social interaction does it get. This includes things like Facebook or Twitter likes and shares etc. If you can combine all three of these areas, Keywords, Relevant Quality content and some reasonable backlinks you are well on your way to seeing your website on page one of Google. All going well it will be bringing in customers for you in a few months time. This was just a quick overview on the basics of SEO and its advantages for business websites. Hopefully, you can take away a few key points and apply them to your website. If you have any questions please get in touch or leave a comment below. I would love to hear how you got on with your SEO experiments.